US Open champion Sloane Stephens beat Latvian Jelena Ostapenko 7-6 (7-5) 6-1 to win her first Miami Open title. American Stephens looked tense at the start and there were eight breaks of serve in the first set before the home favourite prevailed in the tie-break. The 25-year-old world number 12 relied heavily on her defence before putting her foot on the gas in the second set. World number five Ostapenko, 20, was left to rue an unforced error count of 48 which cost her a first win in Miami. It was the first meeting between the pair, both Grand Slam winners in the past 12 months, and their nerves showed in the opening exchanges as the first four games went against serve. 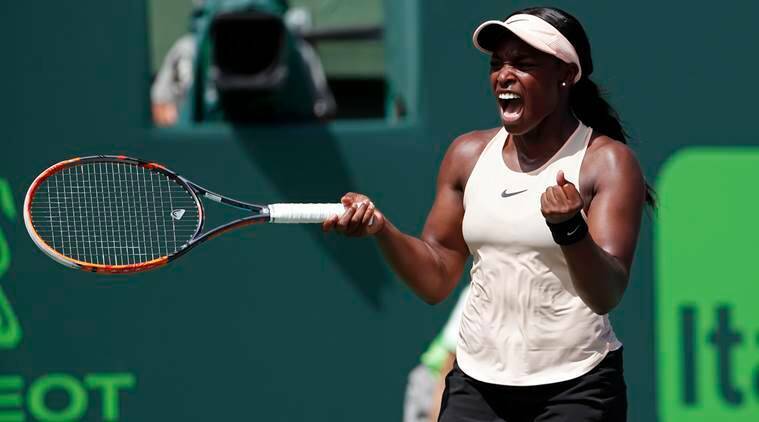 Stephens had beaten three former Grand Slam champions – Garbine Muguruza, Angelique Kerber and Victoria Azarenka – to make the final, but she struggled initially against an aggressive Ostapenko. Stephens hit just three winners in the first set, relying on 29 unforced errors from the Latvian to scrape through the tie-break. Florida native Stephens showed her improved speed as she continued to return Ostapenko’s hits, before finally coming alive in attack at 3-1 with a deft drop-shot and a brilliant cross-court winner as the finish line came into sight. The American ramped up the tempo and swept through the final games to win in one hour 31 minutes. Having lost eight matches in a row following her US Open triumph, Stephens has now responded to that slump with a sixth WTA title that will move her into the world top 10 for the first time when the rankings are released on Monday.